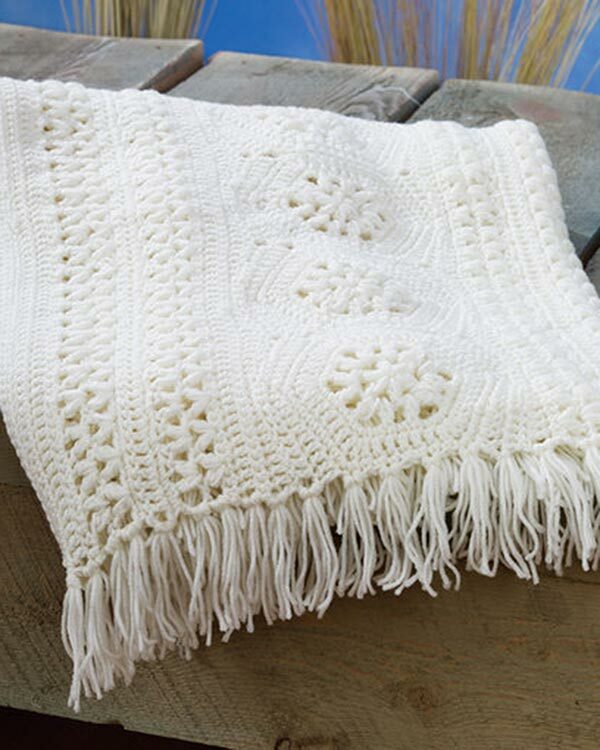 Crochet afghan features alternating panels of white lace and pretty openwork hearts. GAUGE: 21 sts = 7″; 14 rows = 8Â½” in dc with larger hook. CHECK YOUR GAUGE. Use any size hook to obtain the gauge. Throw measures approximately 48″ x 65 1/2″. With larger hook and CA, ch 23. Row 1 (Right Side): Dc in 4th ch from hook and in each ch across; turn – 21 sts. Row 2: Ch 3, skip first dc, dc in next dc and in each dc across, dc in top of ch-3; turn. Row 3: Ch 3, dc in next 7 dc;[yo, draw up a lp in next st, yo, draw through 2 lps] 3 times, yo, draw through all 4 lps on hook – dc3tog made; ch 3, dc3tog working first dc in same st as last dc of last dc3tog, dc in last 8 sts; turn. Row 4: Ch 3, dc in next 6 dc;[yo, draw up a lp in next st, yo, draw through 2 lps on hook] twice, yo, draw through all 3 lps on hook – dec made; ch 5, dec, dc in last 7 sts; turn. Row 5: Ch 3, dc in next 5 dc, dec, ch 3, working over the ch-5, 3 dc in 2nd ch of ch-3 two rows below, ch 3, dec, dc in last 6 sts; turn. Row 6: Ch 3, dc in next 4 dc, dec, ch 3; 2 dc in next dc – inc made; dc in next dc, inc, ch 3, dec, dc in last 5 sts; turn. Row 7: Ch 3, dc in next 3 dc, dec, ch 3, inc, dc in next 3 dc, inc, ch 3, dec, dc in last 4 sts; turn. Row 8: Ch 3, dc in next 2 dc, dec, ch 3, inc, dc in next 5 dc, inc, ch 3, dec, dc in last 3 sts; turn. Row 9: Ch 3, dc in next dc, dec, ch 3, dc in next 3 dc, dec, ch 4, dec working first dc in same st as last dc of last dec, dc in next 3 dc, ch 3, dec, dc in last 2 sts; turn. Row 10: Ch 3, dc in next 2 dc, ch 3, dc in next 4 dc, ch 4, sc in lp, ch 4, dc in next 4 dc, ch 3, dc in last 3 sts; turn. Row 11: Ch 3, dc in next dc, inc, ch 3; [draw up a lp in next dc] 4 times, yo, draw through all 5 lps on hook – 4sctog made; ch 4, sc in next lp, hdc in sc, sc in next lp, ch 4, 4sctog, ch 3, inc, dc in last 2 sts; turn. Row 12: Ch 3, dc in next 2 dc, inc, ch 2, 2 sc in next lp, sc in next 3 sts, 2 sc in next lp, ch 2, inc, dc in last 3 sts; turn. Row 13: Ch 3, dc in next 4 dc, dc in each of next 2 ch, dc in next 7 sts, dc in each of next 2 ch, dc in last 5 sts; turn – 21 sts. Rows 14 and 15: Rep Row 2. Rep Rows 2-15 6 more times; with right side still facing, ch 1, work 201 sc down long edge. Fasten off. With right side facing, attach yarn and work 201 sc across rem long edge. Fasten off. Row 1:With right side facing and smaller hook, attach CB in first sc at lower right edge; ch 1, sc in each sc across; turn. Row 2: Ch 5, skip first 2 sc, sc in next sc, * ch 5, skip 3 sc, sc in next sc; rep from * to last 2 sc; ch 2, dc in last sc; turn. Row 3: Ch 1, sc in dc, * ch 5, sc in ch-5 lp; rep from * across, working last sc in 3rd ch of ch-5; turn. Row 4: Ch 5, sc in ch-5 lp, * 3 dc in next sc, sc in next lp **, ch 5, sc in next lp; rep from * to last sc, end at **; ch 2, dc in last sc; turn. Row 5: Ch 1, sc in dc, * 3 dc in next sc, skip next dc, sc in next dc, 3 dc in next sc, sc in next lp; rep from * across, end as Row 3. Row 6: Ch 5, skip next dc, * sc in next dc, 3 dc in next sc, skip next dc, sc in next dc **, ch 5, skip next 3 sts; rep from * to last 2 sts, end at **; ch 2, skip next dc, dc in last sc; turn. Row 7: Ch 1, sc in dc, * ch 5, skip next dc, sc in next dc, ch 5, sc in next lp; rep from * across, end as Row 3. Row 8: Ch 4, sc in lp, * ch 3, sc in lp; rep from * to last sc; ch 1, dc in last sc; turn. Row 9: Ch 1,sc in dc,sc in ch-1 sp, sc in sc, * 3 sc in ch-3 sp, sc in sc; rep from * to last sp; sc in next sp, sc in 3rd ch of ch-4. Fasten off. Narrow Border: With right side facing, rep Rows 1-5 only on opposite side of panel. Work same as Right Panel, reversing placement of Wide and Narrow Borders. Work same as Right Panel EXCEPT work Narrow Border on each side of both panels. Lower Edging: With right side facing and larger hook, attach CB in corner; ch 1, 13 sc across border, [23 sc across panel, 14 sc across border] 4 times; turn – 161 sc. 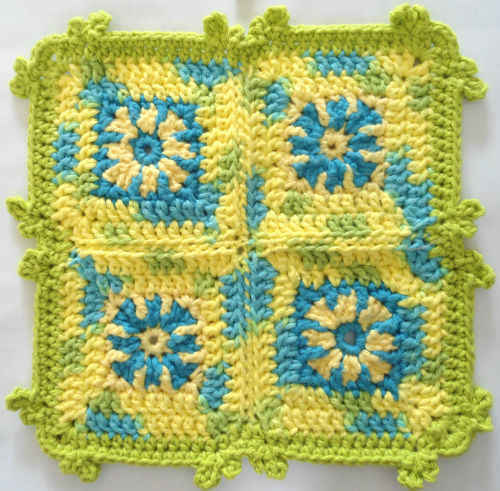 Work Wide Border Rows 2-4, then Rows 7-9. Fasten off.Rep Edging on upper edge. Attach CB and work 9 sc across each side of Upper and Lower Edgings. Weave in ends. 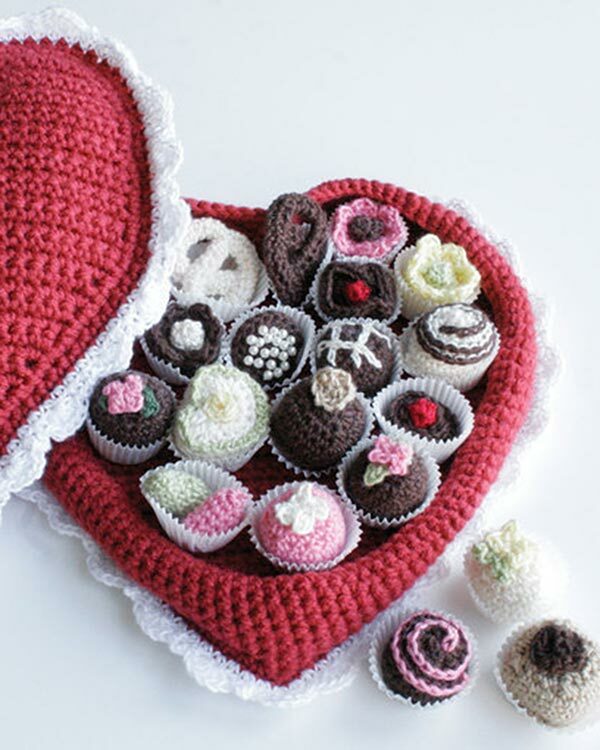 CA, CB = Color A, Color B; ch = chain; dc = double crochet; hdc = half double crochet; lp = loop; mm = millimeters;rem = remain(ing);rep = repeat;sc = single crochet; sl = slip; sp = space; st(s) = stitch(es); yo = yarn over; * or ** = repeat whatever follows the * or ** as indicated;  = work directions given in brackets the number of times specified.